Lit­er­ary madeleine: a delec­table book, poem, phrase, word (or mem­o­ry derived from same). 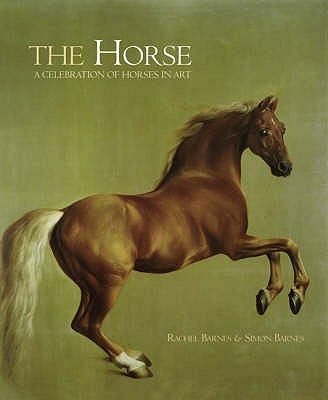 While prepar­ing for this month’s Bookol­o­gy I read and looked at many books about hors­es, and this is the one that was total­ly (totes!) unex­pect­ed. I was wowed. Even bet­ter, after an ini­tial perusal I felt com­pelled to page through it again and again, study­ing the text and savor­ing the images. In art, paint­ings over a cer­tain size are clas­si­fied as “mon­u­men­tal.” This is a mon­u­men­tal book, 17’’ (h) x 14” (w). Accord­ing­ly, the reproductions—many on dou­ble page spreads—are much larg­er than any that could be viewed on a com­put­er screen; fur­ther, the paper and image qual­i­ty suc­cess­ful­ly con­vey the tac­tile ele­ment of the art­work. The price tag is also mon­u­men­tal; that along with the size would make this book a ques­tion­able one to add to a school library or a per­son­al col­lec­tion, but its impact as a class­room or liv­ing room vis­i­tor is easy to imag­ine. His­to­ry? You bet. 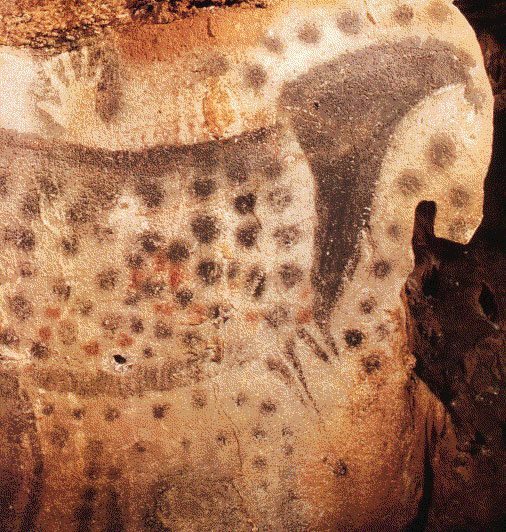 The book is orga­nized chrono­log­i­cal­ly, from the cave painters to Picas­so. How did the human rela­tion­ship to hors­es change? Why? How did those changes show up in our art? Sci­ence? You bet. 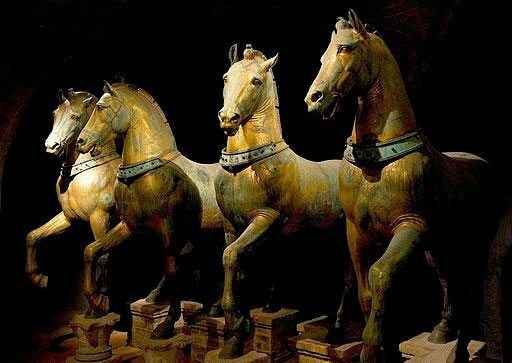 The green pati­na on the bronze hors­es at Saint Mark’s in Venice is enough to trig­ger many con­ver­sa­tions about basic chem­istry and pol­lu­tion. Lan­guage arts? You bet. 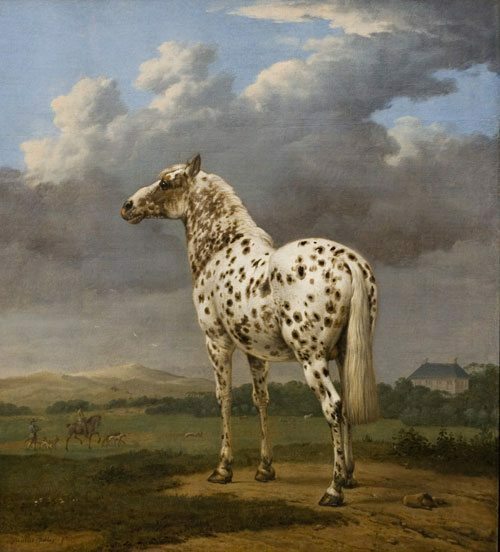 Begin with Paulus Potter’s paint­ing, “The Piebald Horse.” Piebald. This vet­er­an writ­ing teacher smiles at the idea of using the word as a prompt for any num­ber of writ­ing exer­cis­es. Of course, there would be some class­room cau­tions should the book be shared that way. Because the focus is on West­ern art, the ear­ly sec­tions include a fair amount of Chris­t­ian imagery. And—yet again—most of the (known) artists are white men. The Horse Fair, 1853–5 Met­ro­pol­i­tan Muse­um of Art New York, New York USA Click to enlarge. Rosa Bon­heur (The Horse Fair, left): “In order to make stud­ies at the horse sale in Paris she obtained police per­mis­sion to dress up as a man, so she could move more eas­i­ly around the crowd” (p.123). Bron­co Bust­ing c.1925–35 Smith­son­ian Amer­i­can Art Muse­um, Wash­ing­ton DC USA Click to enlarge. Veli­no Shi­je Her­rera (Bron­co Bust­ing, right): “Her­rera was born in Zia Pueblo in New Mex­i­co. 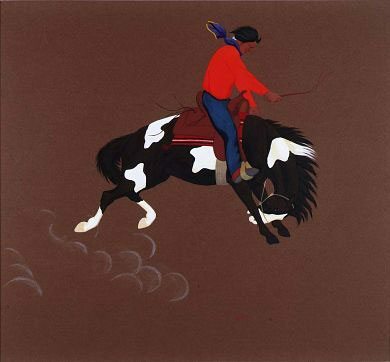 He became rec­og­nized for his quo­tid­i­an scenes of the Pueblo Indi­an Life … this work is signed with his Native Amer­i­can name Ma Pe Wi” (p. 184). One final warn­ing: this is not a lap book. To savor it you will need a table and time.